, but Dec. 14th is just one day of the year. Instead there is a better use for those old test tubes: single stem flower vases. A fun way to create a stunning display is to pick up a couple brackets from the local hardware store and organize them on a empty space of wall. 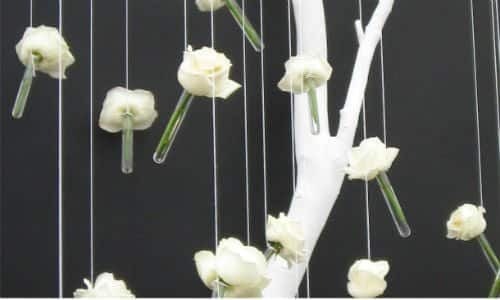 Then place the test tubes in each of the brackets, including your favorite variety of flowers in the tubes. Easy to clean and change up, this wall display allows you to have a fresh and green design in your home that allows you to show off your sense of style. Do you find the windowsill in your kitchen bare and empty? Simply purchase or build your own test tube rack to put your favorite flowers in to give you a unique and fashionable way to display your favorite flowers. You can also fill you glass test tubes with colorful rocks and stones to create an even more visually exciting display. is that they are slender and easy to fit into tight spaces that you could not otherwise fit a normal vase. So imagine all the fun places you can put these crafty little flower vases to brighten up your home.